Dylan Wald. Photo by Linsday Thomas. Dylan Wald is from Minneapolis, Minnesota. He studied at Minnesota Dance Theatre & the Dance Institute, where he became an apprentice in 2012, and Pacific Northwest Ballet School. He attended summer courses at Pacific Northwest Ballet, the School of American Ballet, The Juilliard School, and Hubbard Street Dance Chicago. 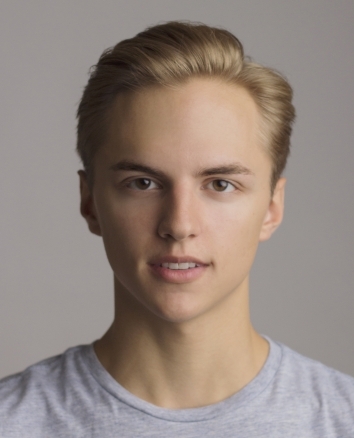 Mr. Wald joined Pacific Northwest Ballet as an apprentice in 2014. While a student at Pacific Northwest Ballet School, Mr. Wald performed corps de ballet roles in Company performances of George Balanchine’s A Midsummer Night’s Dream, Peter Boal’s Giselle, Ronald Hynd’s The Sleeping Beauty, Crystal Pite’s Emergence, and Kent Stowell’s Nutcracker. He performed a leading role in Kyle Davis’ Sylvia for Pacific Northwest Ballet School’s annual School Performances and a leading role in Bruce Wells’ Pinocchio. He also originated roles in ballets by Angelica Generosa and Jahna Frantziskonis, Price Suddarth, and Ezra Thomson for Pacific Northwest Ballet’s annual NEXT STEP program. What is your most embarrassing story on stage at PNB? In a particular performance, I was cast in the third ballet of four that evening. Halfway through the first ballet, with my hair and make-up done, my body warmed-up, my costume on… my performance shoes no where to be found. Sheer panic, of course, as I prepare to dart home to grab my tan ballet shoes in Seattle’s pouring rain (thankfully, only two blocks away from the theater). I made it back before the piece, but I wasn’t planning on telling anyone of my complete idiocy. Until, I was asked why my warm-up pants were soaking wet. Is there a choreographer you are dreaming to work with? What is one of your favorite places to go in Seattle? I have become a big foodie since living in Seattle. When I find myself downtown, I always make my way to Pike Place Market for this Greek yogurt – Ellinos. It’s better than ice cream! Do you have a performance ritual? (Laughs) My performance ritual actually begins the weekend before the show. I must make sure my ‘real life’ responsibilities are in order, so I don’t have anything distracting me from the performances coming up. The day of the show, I actually try to treat as a normal day. I work-out in the morning, take company class, go to the rehearsals I’m called to. I try to keep myself as present and as calm as possible. Afterwards, I will nap, eat and shower. Pack my bag for the theater – making sure I have my SHOES, a flower for my partner perhaps, and snacks… oh and lots a hair gel. Arriving to the theater early and warming the body back up is an important part of anyone’s routine. However, I have found that keeping my head in a positive, present state all day, before, and during the show is most beneficial in making my performance feel natural. Dylan Wald and Elizabeth Murphy in Little mortal jump. Photo by Angela Sterling; choreography by Alejandro Cerrudo. Dylan Wald in The Calling. Photo by Angela Sterling; choreography by Jessica Lang. Dylan Wald in The Vertiginous Thrill of Exactitude. Photo by Angela Sterling; choreography by William Forsythe.